Soda Bread with Milk Chocolate and Salted Honey Butter. Bread is never my choice of snack… until now. There have been countless other posts over the years where I’ve flakily declared “I’m a bread person!” and this one may not be any different. But there is a sliiiiight difference. This bread makes me want to SNACK. And I’m not talking about a snack of delicious things piled on toast. We all know that’s something I’m embarrassingly basic about. Give me all sorts of things piled on top of toast and we’re good to go. But just plain bread or toast? Rarely. I’ve made soda bread before – brown butter whole wheat! soda bread to be exact. It’s gooood. I shared it along with a full conversation of our fun Saturday nights of the past, which involved watching Suze Orman and eating froyo. Things aren’t much different and oh wow are we boring. Eddie is a huge snacker of bread. Not in the way that he eats an entire loaf of bread and can’t control himself, but more in the way that he loves a piece of toast or three with butter or sometimes jam before bed. Oh but. He does this terrible thing. This terrible horrible no good very bad thing. Even if we eat dinner late, a lot of nights he will make some toast around 9 or so. No matter what though? He ALWAYS leaves the jar of jam out on the counter. Like always. It is maddening. Sometimes he leaves the jar out, OPEN, with a knife inside. ON THE COUNTER. All night long. That last part isn’t necessarily an issue since every summer we end up buying twelve or thirteen jars of preserves from American spoon. But still. I make sure we have separate jars. This bread is doing that. Makin’ me snack. It’s bad. But good. But bad. But good. It even has been doing that for my mom, who also doesn’t really care about snacking on bread or toast. She had two pieces of this the afternoon that I made the bread and took them down quicker than anything I’ve ever seen her eat. She is notoriously the slowest eater in our family, and I really wish that I inherited that trait. I know that since I added chocolate, this isn’t technically soda bread. Right? It’s… *technically*… tea cake? But guys. I mean… raisins. Really? RAISINS? No thanks. Not ever. In life. Never ever ever. It’s just one ingredient. Puhhhlease let me have it. Oh and the butter! Salted. Honey. Butter. Use unsalted butter – that way you can control the salt. Add a bunch of honey to sweeten it up. Then add the salt. As much or as little as you’d like. 1/4 teaspoon salt, or more, or less! Preheat the oven the 375 degrees F.
In the bowl of your electric mixer fitted with the paddle attachment, whisk together the flour, sugar, baking soda, salt, cinnamon and cardamom. In a smaller bowl, whisk together the buttermilk and egg. With the mixer on low speed, slowly pour in the milk mixture. Mix on medium speed until the dough comes together. Toss the chocolate chunks with a bit of extra flour and add them to dough. Stir to mix. Place the dough on a floured surface and knead it a few times, using some extra flour if it’s super sticky. Form it into a round and slice an X on the top – I place mine in a dutch oven, so made it about 8 inches wide. You can also place it on a parchment-covered baking sheet. Bake the dough for about 45 to 55 minutes, until golden on top and set. I cooled mine in the dutch oven it was baked in. You can serve it warm or let it cool completely! Stir together ingredients until combined. Sprinkle extra salt on top if desired! That seems like an appropriate bread-to-butter ratio. CHocolate Chips win over raisins ANY day … and ahhh marriage, gotta love it!! My husband is famous for leaving open cookie packages out over night … ahhh and then they become all soggy, or when i bake he won’t close the cookie jar. Gotta love him, except when I want to ninja kick him mentally. oh i totally know what you’re talking about. that’s the WORST. Completely agree with you on the raisins part. This bread looks delicious while I – like you and your mother – am not a person to snack on bread. Can’t wait to try a bread like this! I knew I liked you, you can always substitute chocolate for raisins….. cmon. an orange pecan raisin cake. It made it sooooo much better! Yuck, left out jam tastes tinny. I hide my jam in the fridge from my husband. Also, what about the little bits of hard jam in the peanut butter…..but I love him. YES. this is a problem in our house too. the worst. I am so totally a bread person and this bread looks extra fabulous. Dense and delicious and pockets of chocolate? I’m in. I am a total bread person but have cut back a bit since I have zero control when it’s homemade! Not only does it taste amazing warm out of the oven but can anything beat the smell when it’s cooking!? I’ve made honey butter before and it’s delicious! i do have very little control when it’s homemade too. SO good. I luuuurv soda bread. And with salted honey butter? Girlfriend. Chocolate > raisins. This bread wins all soda breads. soda bread with chocolate > soda bread with raisins. and salted honey butter?! duh. You had me at salted honey butter! There is so much wonderful going on right here! AHHHHH!!! :) I’d eat the whole loaf. Looks like the PERFECT easter bread! Already loving this! ha!! that is such a great idea. i might actually do it! Girl… this is a game changer. Seriously. What an awesome and unique pairing! 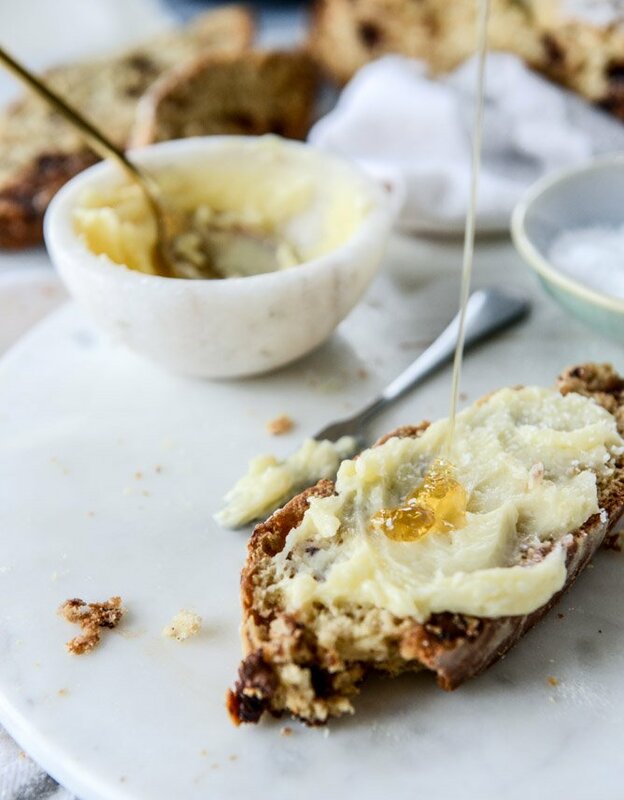 I’m not usually a fan of soda bread but my mouth is watering at how good it would be with the sweet and salty honey butter on it! in which case I absolutely love them. Raisinets are my favorite candy of all time. i can OCCASIONALLY get on the chocolate covered raisin train. but only for like, maybe 5 raisins. tops. I’m not a bread person but, this looks yummy! Pinned! I not really a like soda bread but after looking at your post, I would like to make it a try for this. The flavor of sweet and salty.. Nice combination! That’s hilarious about the jam jar, totally something I would do. Ok, and this bread! You won’t get any arguments from me about switching the raisins out for some chocolate! i didn’t! i just stuck the dough in, it was pretty floured on the outside. it didn’t stick at all! i don’t think nonstick spray or parchment would hurt though, so if you’re skeptical, do it! Woah, this is a game changer. Salted honey butter you say? Excuse me while I go and whip that up and eat it with a spoon! Huge bread lover over here too, this all sounds amazing. Making this with Kaylin on Thursday! Snacking is not my favorite, but this bread is going to be an exception. Adding chocolate to it has made it more wanting. hey girl this looks delish! Ya by the way about the jam jar that sounds like what my husband would do ( Ha) crazy how these husbands are huh? That salted honey butter sounds too good to be true. I’m not much of a snacker either, but I’m sure this would convert me! Did you cover the dutch oven when baking? Made this last night, it’s already half gone. Sooo yummy! Gosh, I’m already addicted to butter so this is dangerous! I’ve had honey butter before but salted honey butter is a whole other level of awesome. I could probably go through the whole thing embarrassingly fast. it is really dangerous. like REALLY. 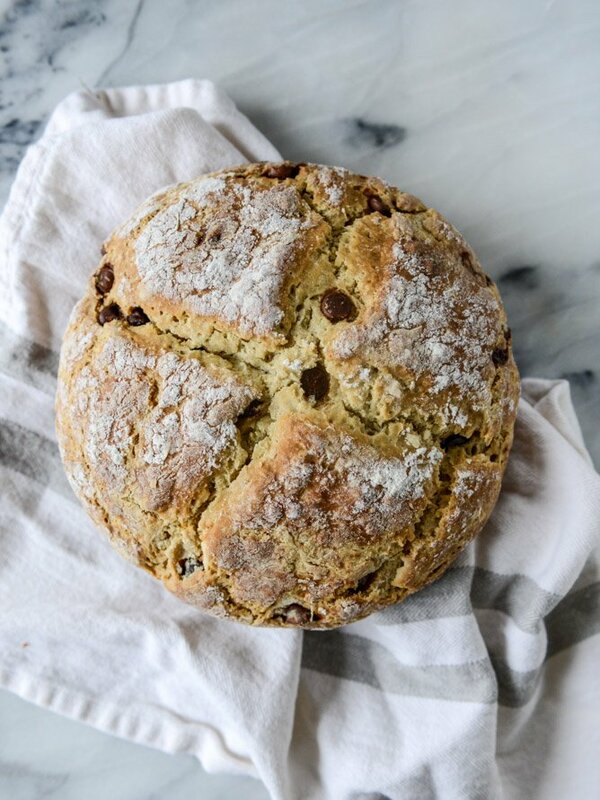 Your post inspired me to make Irish Soda Bread on St. Patrick’s Day. I used this recipe, but swapped a little bit of white whole wheat for the all-purpose, and I added some raisins :X! I made the salted honey butter, too, and I was basically eating it with a spoon. Amazing stuff. Thanks for the solid recipe & inspiration! I love this post!! Looks beautiful! 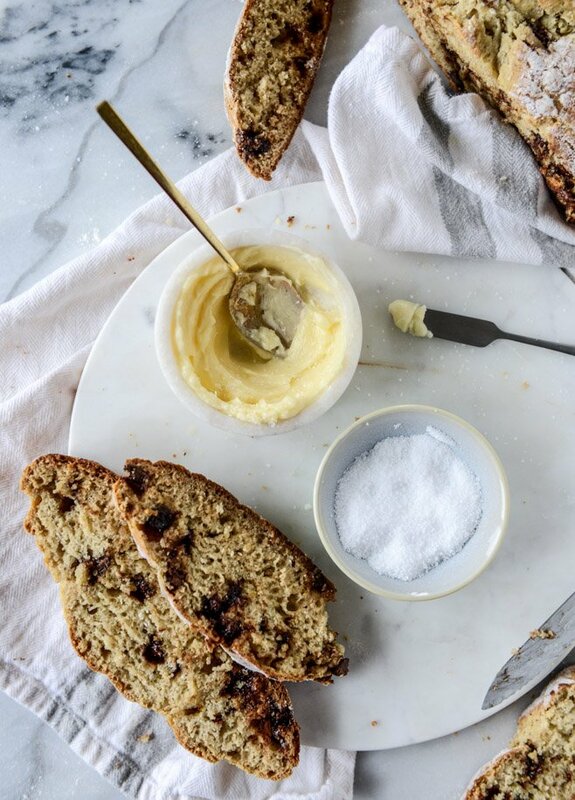 Nothing I love more than homemade bread and I’m more than intrigued by the honey brown butter spread. Sounds delicious. Thanks. Oh my gosh – this entire post cracked me up!! Can’t wait to try this deliciousness!!! I wouldn’t say I am a huge soda bread fan but this one… with chocolate and cinnamon and cardamon. Yummy! I would be snacking all night long! Made this on Saturday for Sunday brunch in my pumpkin shaped Dutch oven. It was a huge hit and the salted honey butter is genius. Added some dark cherry jam to the top and everyone loved it. Thanks for a memorable recipe! Are you kidding? This looks absolutely amazing. One of my wife and I’s favorite treats is croissants and butter from a local bakery. It’s so simple, but so delicious. Thanks for this great post. It is actually a nice and helpful recipe. Thank you for sharing. -Fill your jar half-way with cream. -Pop the lid on, and start shaking. -When the sloshing sounds stop, remove the lid, and check for whipped cream! -Pop the lid back on, and continue to shake until the mixture separates into buttermilk and butter. -Remove lump of butter (save the buttermilk for baking). -Rinse butter under cold water, kneading any buttermilk out of the butter. -Stir in a dash of salt if you wish. -Your butter won’t keep for long because there are no preservatives. If you’re not eating all of it the first day, store in the fridge for another day or two. -Store in the fridge if keeping for more than one day. 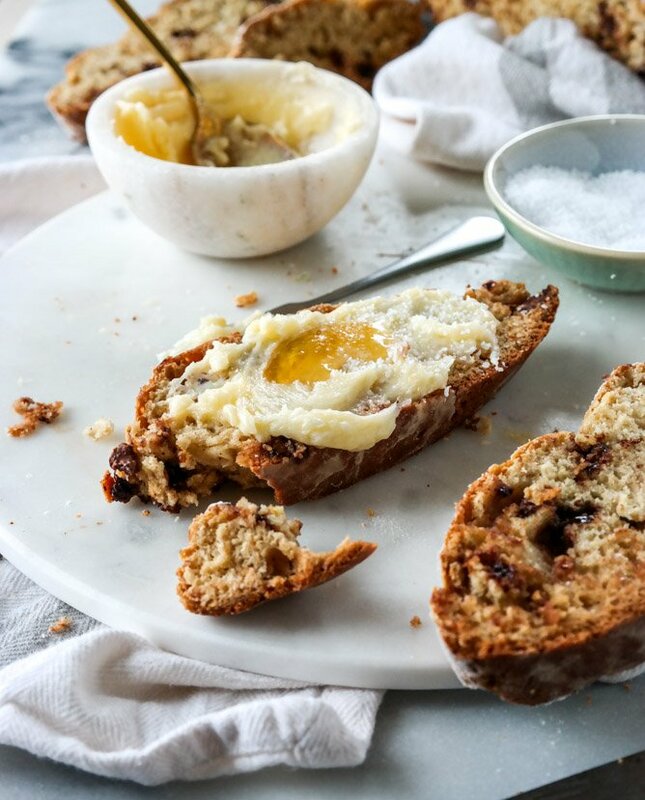 This recipe just made me decide to replace my traditional recipe for Irish soda bread for this one! And, the honey butter…. OMG! What a shake up in the most delicious way! Thank you! I made this recipe this week. My entire family is raving about it!! The chips are so awesome in it; so much better than raisins!! Thanks! !